I suppose there's some kind of irony to waxing lyrical about the joys of holding an actual, physical comic and illustrating my post with images which you, the reader, will be viewing on a computer screen - but it's one we'll just have to live with I'm afraid. In an age where the future of comics appears to lie in a digital format, wandering into a newsagent's and plonking down your pennies in exchange for a printed publication may well soon be a thing of the past, but to this old dinosaur, using a laptop, iPad or mobile 'phone to follow your favourite funnies or herculean heroes just can't compare to the 'real thing'. There's something about the shape and feel of a comicbook, the ink on the page, the smell of the paper even - which the digital impostor cannot match, and - truth to tell and without meaning to be patronising - I feel kind of sorry for future generations if their only exposure to printed comicbooks is going to be looking at them in an airtight, temperature-controlled glass case in a museum somewhere. Let's hope that the two formats - digital and traditional - can co-exist for many more years yet at the very least. Anyway, back to the fascinating subject in hand, which is the next batch of '80s MARVEL TALES reprints of '60s SPIDER-MAN adventures by STAN LEE and STEVE DITKO. 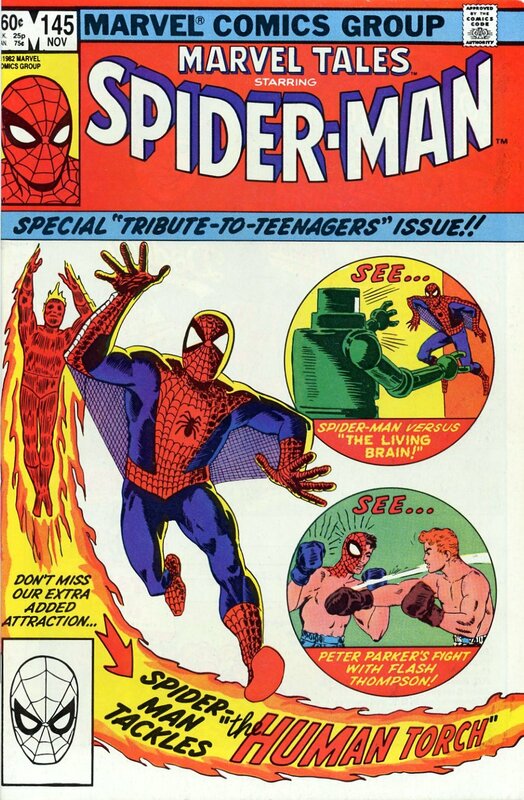 Apparently, the FANTASTIC FOUR stories by Lee and JACK KIRBY were considered for a similar treatment, although I now forget if it would've been in a separate reprint mag or after the Lee and Ditko Spidey stories had run their course. Not that it matters much because it never happened. Readers had to wait until the advent of the MASTERWORKS series of volumes a few years later to see the early FF classic tales. Anyway, I'd better not keep you from the goodies any longer - enjoy these cataclysmic classic covers from yesteryear. 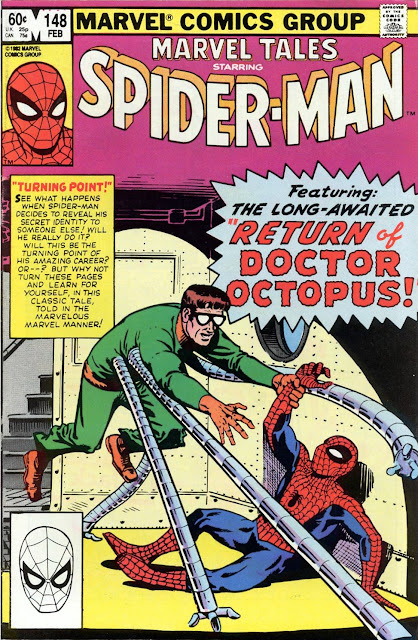 Sharp-eyed readers will have noticed that the above image has been 'flipped' from its initial appearance and that DOC OCK's face has been changed to a more slimline version. The glasses seem like an afterthought, not being rendered too well - and look as if they're about to fall off. Also, when the original cover was first printed, back in the '60s, Stan Lee had Jack Kirby redraw the lower parts of Spidey's legs, being dissatisfied with Steve Ditko's rendition of them. Curiously, for the Marvel Tales reprint they've been redrawn yet again, not matching either Ditko's or Kirby's versions. The ability to hold a oomic in my hands will never be able to compete with viewing it on a screen. While we may be dinosaurs in that respect, we've also embraced technology to the degree that we can share words and images for so many through the internet. 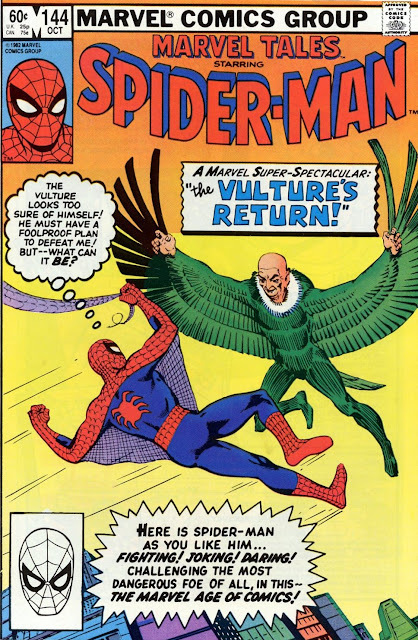 There was talk in the letters pages of Marvel Tales of possibly reprinting the FF or other early Marvel super hero tales in the same monthly format, but it never occured. 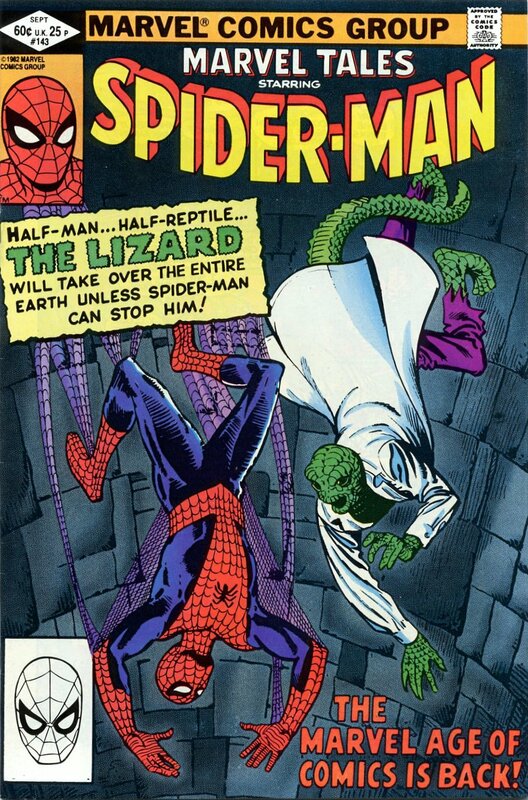 It was fun to read the Lee-Ditko Spider-Man stories every month, the way they originally appeared. 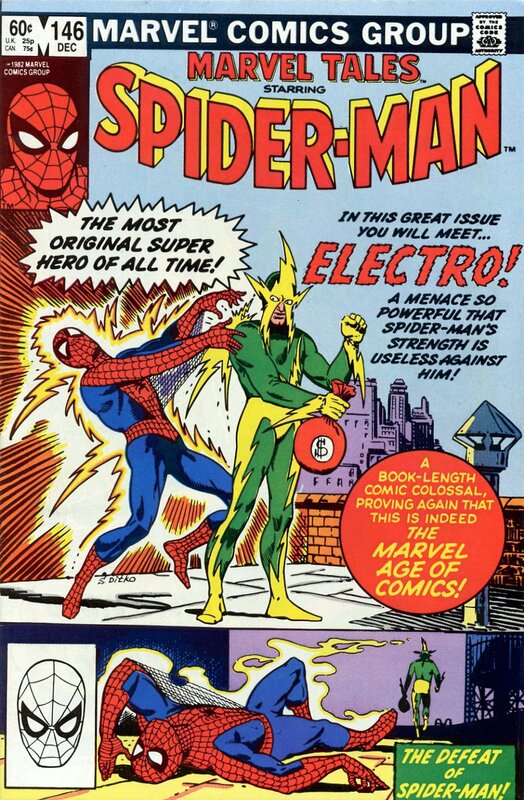 One could see a progression and growth in the strip, and I clearly recall discussing the "new" Marvel Tales with my good friend Frank on a regular basis; what stories worked better than others; the plotting and artwork and the overall personality of the strip. It was a very interesting period and I wish Marvel would have done more reprints in this manner. The only setback was the poor printing which took away from the finished product. Very true about the reproduction, Nick. But you know what? I wasn't really aware of it until I saw the same stories reprinted in the Masterworks volumes. 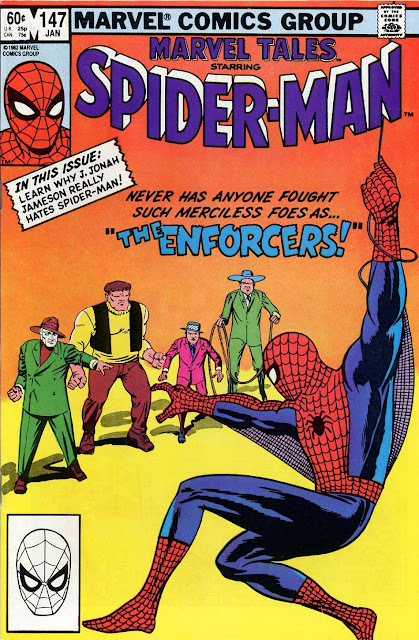 Also, around 1992/'93, Marvel printed a 16 or so issue run of Spider-Man Classics, which used the exact same proofs as Marvel Tales had done ten years earlier. What a difference the superior printing techniques made - the pages were crystal clear and the colours had much more depth to them. GOING TO THE GROSVENOR, GUV'NOR? SNEAKY GOINGS ON IN THE COMICS WORLD...?